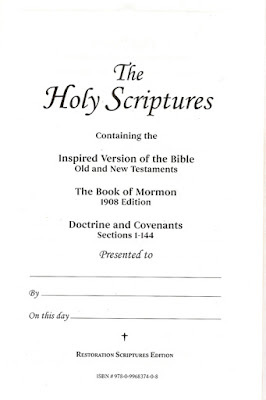 The Inspired Version + Book of Mormon + Doctrine and Covenants = "3-in-1"
“Restoration Scriptures,” a subsidiary of Cumorah Books, Inc., presents The Inspired Version of the Bible and The Holy Scriptures (the RLDS "3-in-1" containing The Inspired Version, the Book of Mormon, and the Book of Doctrine and Covenants). The Inspired Version is also called Holy Scriptures, Joseph Smith Translation, JST, and New Translation of the Bible. 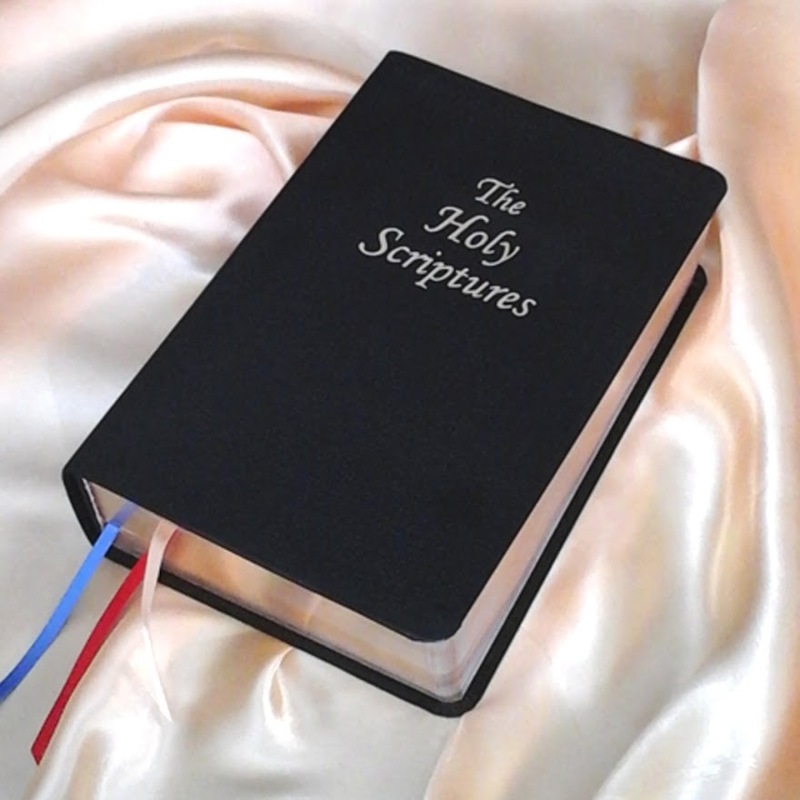 THE HOLY SCRIPTURES, Restoration Scriptures Edition, has the Inspired Version of the Bible, 1908 Book of Mormon, and RLDS Doctrine and Covenants, sections 1-144. It has a bonded leather cover, 1,920 pages of 6x9 inches. Margins are about .6 inch. Edges of pages are gilded. It is not thumb-indexed, but large, bold references are shown at the tops of pages. See scans of a number of the pages below. This book is available only from Cumorah Books, Inc. Scroll down to see the ordering information. 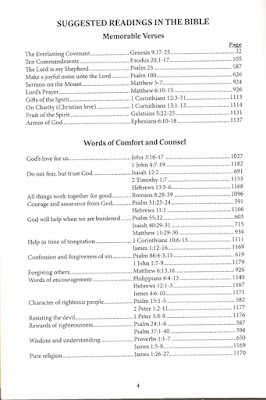 “Restoration Scriptures” is a subsidiary of Cumorah Books, Inc., which has published Restoration Voice magazine since 1978. 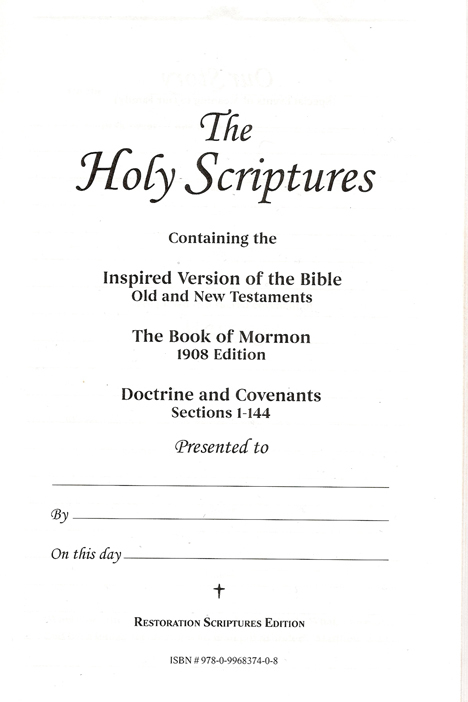 Restoration Scriptures is dedicated to provide the Inspired Version of the Bible, Book of Mormon, and Book of Doctrine and Covenants, all of which have been used by members of the RLDS Church over the years. The pages are the same as the "3-in-1." Scroll down to see a preview of pages. is available for $50.00 per copy. 1 or 2 books will ship for $14.35. of books in Independence area. • A large page size with clear type and wide margins. • Presentation and family history pages. 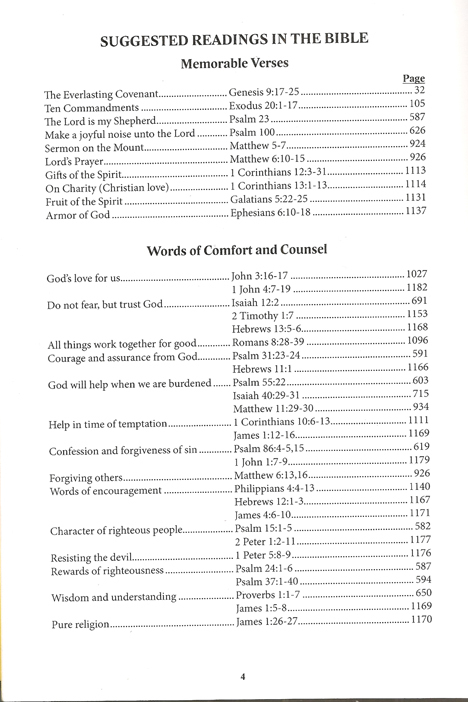 • Pages with familiar verses and suggestions to find important doctrinal information. • Prefaces with samples of corrections printed in this edition. • Bold references at the tops of pages to aid in finding places. 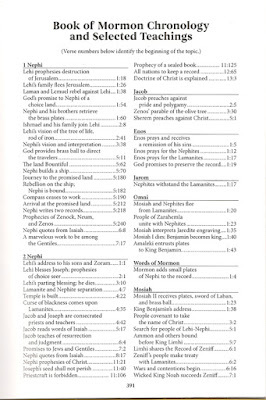 • Headings for all chapters in the Inspired Version and Book of Mormon. 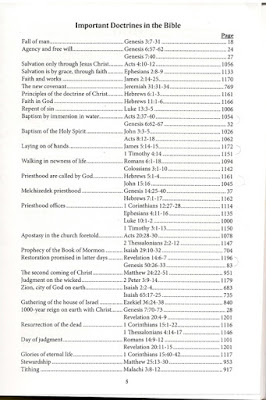 • Historical headings plus context headings for all sections in the Doctrine and Covenants. • Inspired Version—Historical Events, Life of Christ, New Testament Parables. 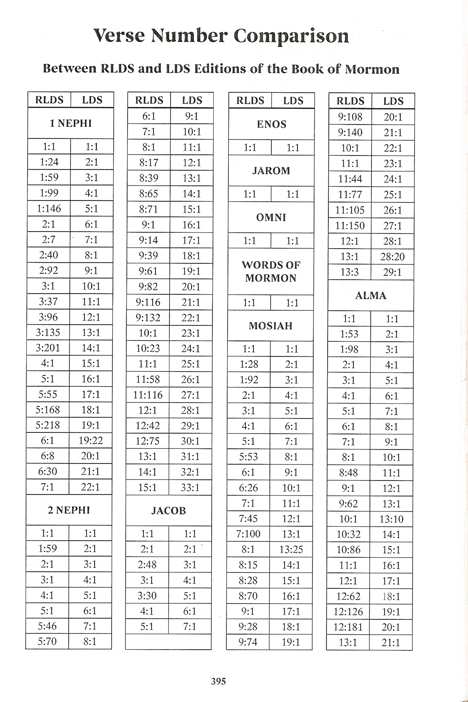 • Book of Mormon—Chronology and Teachings, Verse Number Comparison. 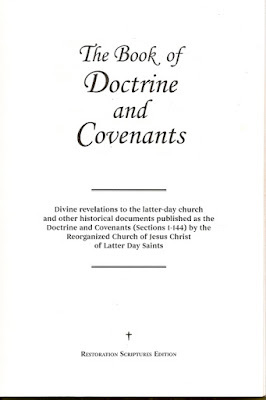 • Doctrine and Covenants—Events in Church History, Section Description. • A new “selected concordance” for each of the Three Books. 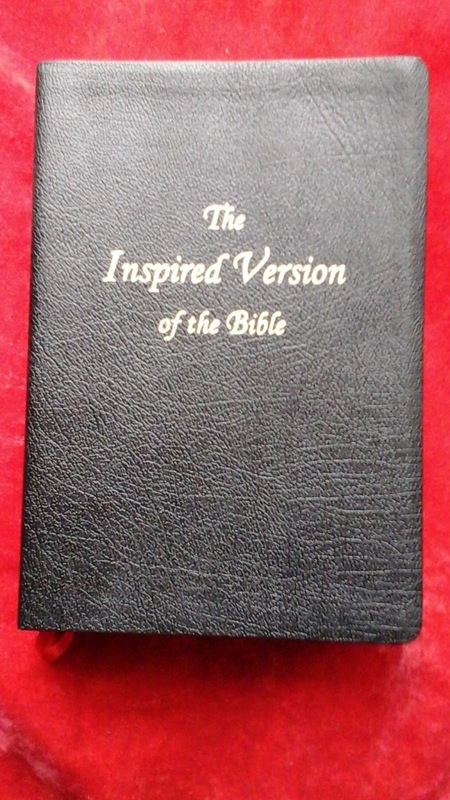 The Holy Scriptures, Restoration Scriptures Edition, is $80.00 per copy. 1 or 2 books will ship via Priority Mail for $14.35 (as of January, 2019). To order, send your name, address, phone number, and e-mail address, along with your check for payment to Cumorah Books, Inc. Phone (816) 210-8450 for additional information or to arrange for home delivery or pickup in the Independence area. Cumorah Books, Inc., and the Scripture Committee announce the forthcoming publication of a new Three-in-One containing the Inspired Version of the Bible, 1908 Book of Mormon, and Book of Doc-trine and Covenants (through Section 144). We plan to have books available by the fall of 2015. 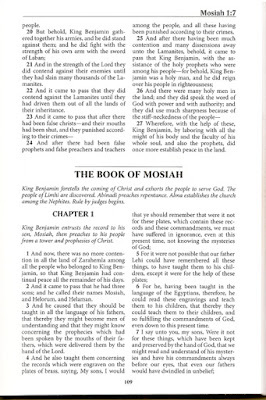 The RLDS Church and the Community of Christ have been the only publishers of the Scriptures as a Three-in-One, but publication stopped several years ago. Many Saints have expressed an interest in again being able to purchase the Three-in-One. (plus a few individuals from Restoration branches and the Community of Christ). Ten people participated at the initial meeting. Since then, a Scripture Committee has met nearly every other week, with eight or nine people taking part in most meetings. The committee includes Scott Bingman, Charlie Booth (for the Inspired Version and Doctrine and Covenants phases), Tara Broadway, Beryle Immer, Bob Immer, Dee Ludy, Paul Ludy, Aaron Rhoads (for the Book of Mormon phase), Jon Tandy, and Gary Whiting. Several others have met with the committee a few times and given valuable assistance. In addition, many Saints have been involved in reading the text which the committee approved. 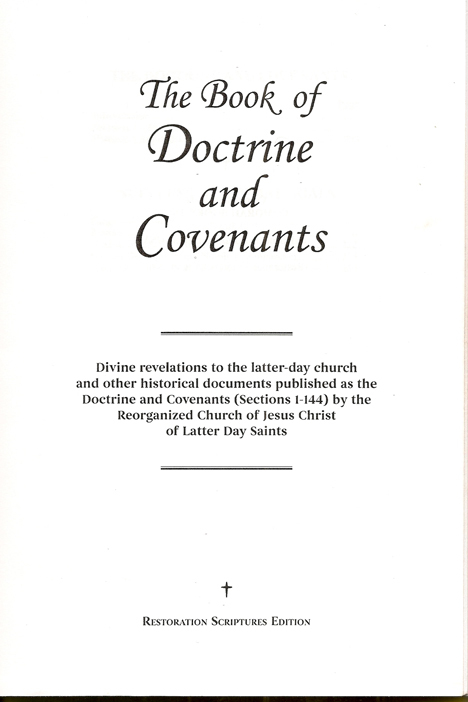 • The Three-in-One should include the Inspired Version, 1908 Book of Mormon, and Doctrine and Covenants through Section 144. • The Scripture text should be as correct as possible. • We will include descriptive headings for all sections and chapters. • For widest acceptance, the Three-in-One should be published independently from any particular "church organization." The editing process has been quite lengthy because of the various editions and printings of the Scriptures. The committee found that different printings of the Inspired Version have some variations in wording. The same is true of the 1908 Edition of the Book of Mormon and the Doctrine and Covenants. The committee prayerfully compared and evaluated those differences to produce this Three-in-One. 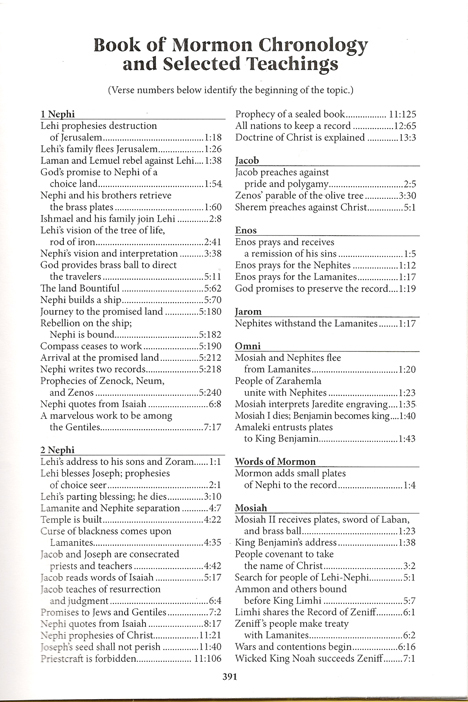 text of the Scriptures in a convenient and easy-to-read format. We invite you to consider ordering books now for yourself, family members, and friends. 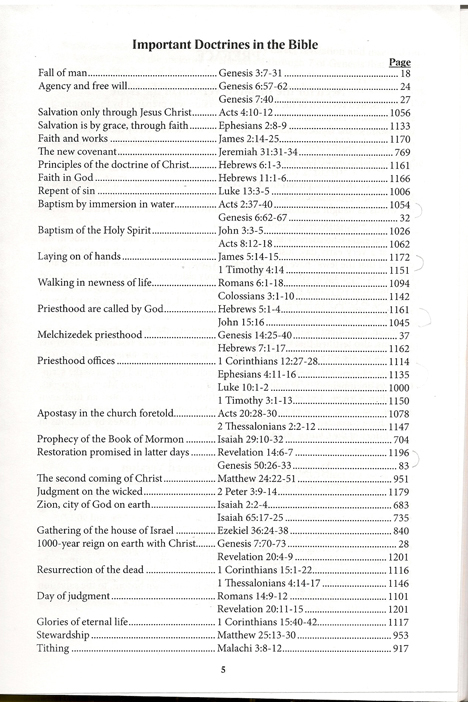 Adapted from Richard Howard, Restoration Scriptures: A Study of Their Textual Development, Second Edition, 1995. There were two Book of Mormon manuscripts, the Original Manuscript (O MS), which was dictated by Joseph Smith, Jr., and the Printer’s Manuscript (P MS), which was produced for the printer to use. The O MS was considered a "first draft." It lacked capitalization and punctuation, and spelling was inconsistent. This MS was placed in the cornerstone of the Nauvoo House and deteriorated. Only a few pages and some fragments remain (they are in the custody of the LDS Church). The P MS was partially refined prior to printing the 1830 Book of Mormon, but E. B. Grandin punctuated the text and divided it into paragraphs. After the 1830 printing, the P MS was marked with additional changes, which were used to produce the 1837 printing in Kirtland. Howard says 2,000 refinements show on the P MS (but another 1,000 revisions in the 1837 edition are not shown on the P MS). 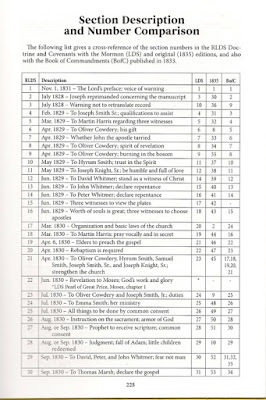 Some changes which were made for the 1837 include "which" to "who" 707 times; "was" to "were," "were" to "was," "is" to "are," and "are" to "is" 137 times; "saith" or "sayeth" to "said" 229 times. Most changes were to grammar and style—however some were theological. The words "Son of" were inserted into the 1830 text in several places, such as "The Lamb of God is the Eternal Father" and "The Everlasting God was judged by the world." Joseph Smith, Jr., personally supervised or was responsible for the textual revisions of the 1830, 1837, and 1840 editions of the Book of Mormon (plus the 1842 Nauvoo edition, which was printed with the 1840 plates). The title page of the 1840 edition says, "Carefully Revised by the Translator." His objective appears to have been to convey the Book of Mormon message and meaning as clearly as possible. 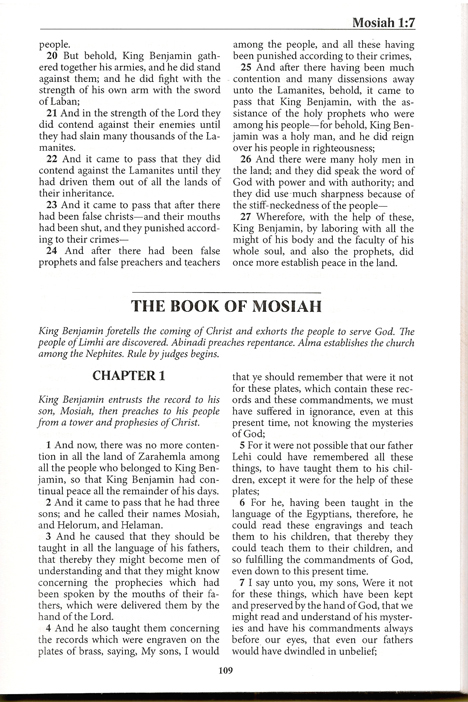 Although the 1840 (and 1842) editions were available in the U.S., the first European edition of the Book of Mormon was based on the 1837 edition. 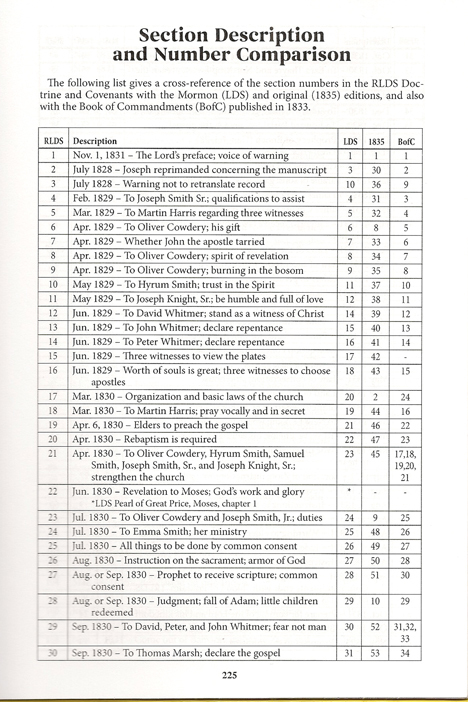 The LDS Church continued using that text and format until 1879. Then the text was divided into more chapters and shorter verses (the 1830 edition did not have separate verses; in later editions some verses were two or three pages in length). In 1858 Zadoc Brook privately reprinted the 1840 Book of Mormon (through James O. Wright and Company in New York). 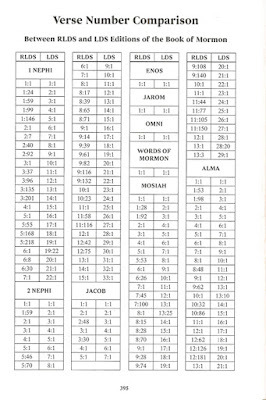 Until the 1874 printing of the Book of Mormon by the RLDS Church, which also used the 1840 text, the Brook edition was generally all that RLDS members had available. The RLDS Church purchased the P MS in 1903 (for $2450.00). That sparked interest in changes, and the 1906 General Conference approved a "Committee on Reversification" to compare the P MS and the 1837 Book of Mormon. The committee did much more than make shorter verses. 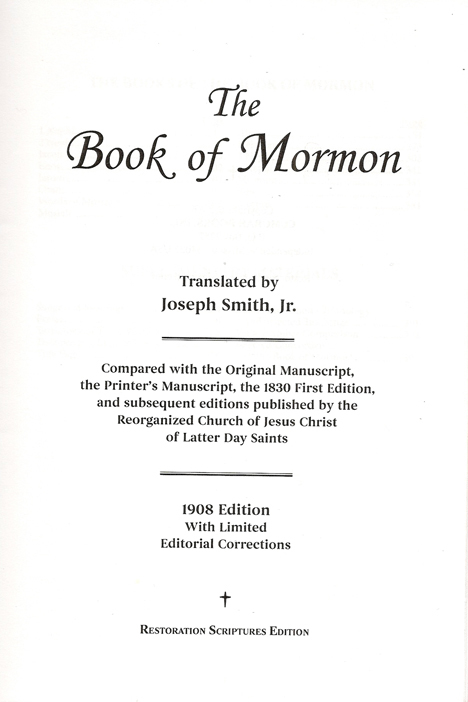 Changes nearly always followed the P MS and disregarded the later revisions of Joseph Smith, Jr., including the 1840 edition and the 1000 changes in the 1837 edition which were not marked on the P MS. 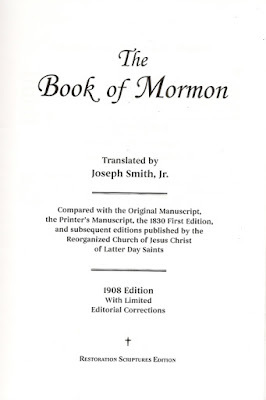 The resulting text of the 1908 edition has closer ties to the 1830 Book of Mormon than to the 1837, 1840, and 1874 editions—even though the note on the title page says, "Compared with the original manuscript and the Kirtland Edition of 1837." These are not the only items which need consideration and correction. But they should serve to help us understand that there is a need to make the text as correct as possible. Do not let problems in the Scriptures tear down your faith in God. Remember the writing of Moroni: "If there are faults, they are the mistakes of men; wherefore, condemn not the things of God" (Preface or title page of the Book of Mormon) and "If there be faults, they be faults of a man" (Mormon 4:21). Note: This is not a complete list, and not every occurrence of a word was changed ("gave" and "past" are good words in the right place).